Is Saleen doing their annual open house this year? If so, does anyone know a date? They are typically mid to late September. Hopefully, we will get an announcement soon. The 22nd Annual Saleen Car Show and Open House will be held at Saleen Headquarters, 2735 Wardlow Rd., Corona, California on Saturday, September 15, 2018 from 8:00 AM to 4:00 PM (PDT). SALEEN and SOEC present the World's Largest Saleen Show! 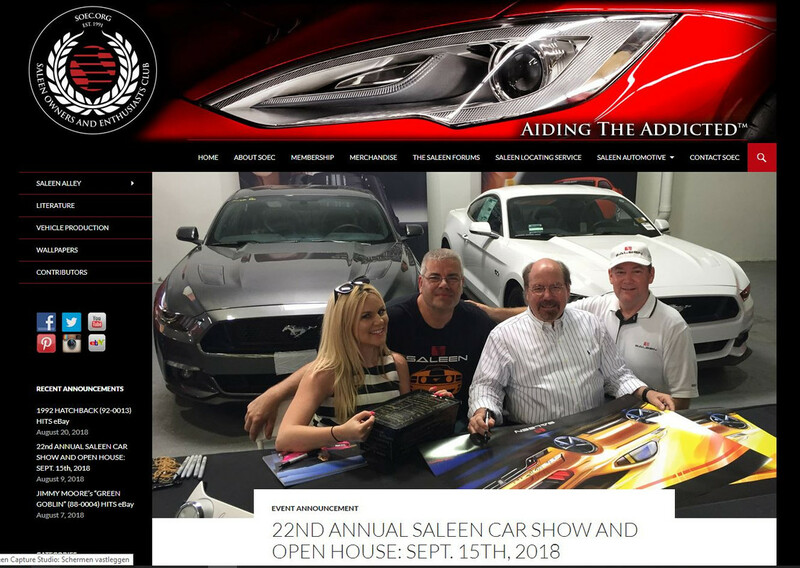 Join Steve Saleen, the Saleen family and the team at "Saleen Headquarters" as we welcome the Saleen Owners and Enthusiasts Club and all Saleen owners and enthusiasts at their annual open house and car show. This is the world's largest gathering of Saleens in the world! Special room rates at Ayres Suites Corona West - Call 800-676-1363 and ask for the Saleen club rate. Friday evening: SOEC Members, Non-Members and Guests Dinner (casual meet with locals and out-of-towners; pay-your-own way). Meet at 5:30 p.m. at Saleen. * More than 25 Saleen classes! * Classes for other Mustangs and Fords, plus Chevrolet, Camaro, Dodge and Challenger, and more! * Special Display Only category for those who don't want their Saleen judged -- bring your daily driver or fixer-upper! * Entertainment for the kids! * Poster signing and autograph session with Steve! * Steve Saleen will autograph Saleen vehicles after the show -- please be by your Saleen vehicle to have it signed. What a great honor to have a photo of myself, Jim Dvorak and Molly & Steve Saleen from the 2015 show chosen to announce the 2018 show. Maybe Saleen will arrange a ticket so I can make it there on my birthday ? Do you have the CJ or Cleveland? Any update on details for dinner tonight?. Just arrived and want to know. May take uber to headquarters to keep my car clean tonight. Thanks. I don't believe there is a dinner tonight (Friday). You my have a few volunteers meeting in Corona tonight to help setup the Saturday event. I am interested in buying one who do I call? Best to call Saleen Automotive directly.